PARAMUS, N.J. — Shortly after holing out on No. 18 at Ridgewood Country Club on Sunday, Tiger Woods fielded a series of questions from reporters. Most related to his play in the event — an unremarkable tie for 40th — and the associated specifics: his putting, his stamina, his swing, his focus. But one reporter dived into the world of politics, asking Woods about President Trump. A day later, Trump responded with a critique of the "Fake News Media" but praised Woods for his response (and his golf game). Woods gamely makes himself available for questions after nearly every round he plays but is otherwise difficult to reach, so reporters seeking comment rely on that time to get Woods to weigh in. That was likely why a New York Times reporter chose Sunday afternoon to query Woods on the nature of his relationship with President Trump. Woods largely deflected the three questions, dismissing the final of the three with a grin: "I just finished 72 holes and I'm really hungry," he said. The relatively innocuous back-and-forth drew far more attention when President Trump tweeted about the exchange Monday morning. "The Fake News Media worked hard to get Tiger Woods to say something that he didn't want to say. Tiger wouldn't play the game — he is very smart. More importantly, he is playing great golf again!" While Woods keeps any political leanings close to the vest, he has known Trump for years. "We've played golf together. We've had dinner together. I've known him pre-presidency and obviously during his presidency," he said on Sunday. Pushed to expand on the nature of their relationship, Woods pointed to the status of Trump's office. "Well, he's the President of the United States. You have to respect the office. No matter who is in the office, you may like, dislike personality or the politics, but we all must respect the office." President Trump and Tiger Woods have known each other for years. Woods and Trump have played golf together since the president's inauguration, at least as recently as November 2017, when the two joined Dustin Johnson and Brad Faxon for a round. Woods and Trump are also connected through a business venture: Trump World Golf Club Dubai, set to open in 2019, was designed by Woods's firm, TGR Design. "My father and Tiger have been friends for a long time," Eric Trump told GOLF.com last year. "They’ve been very, very close. When you combine Trump and Tiger, it’s a match made in heaven. It’s a very amazing combination." But Woods's camp clarified its view of the relationship. 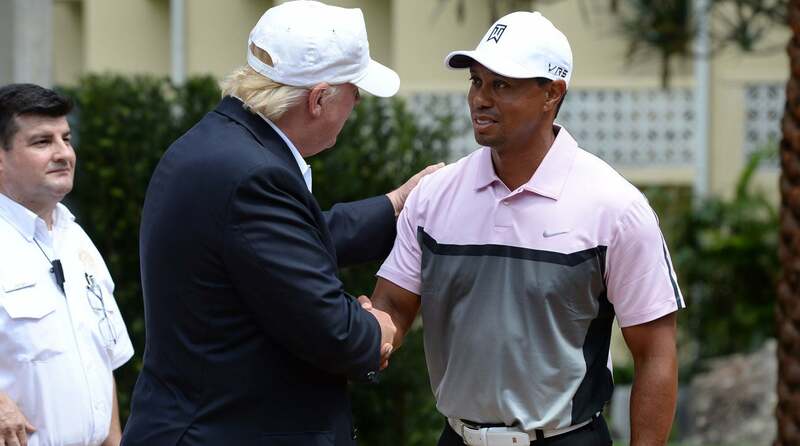 "Tiger is not in partnership with Mr. Trump or his organization and stating otherwise is absolutely wrong," spokesman Glenn Greenspan said at the time. "Tiger Woods Design’s contract and obligation is to the developer, Damac Properties. Our association ends there. I can’t put it any clearer that Tiger Woods Design does not have an agreement with Mr. Trump."